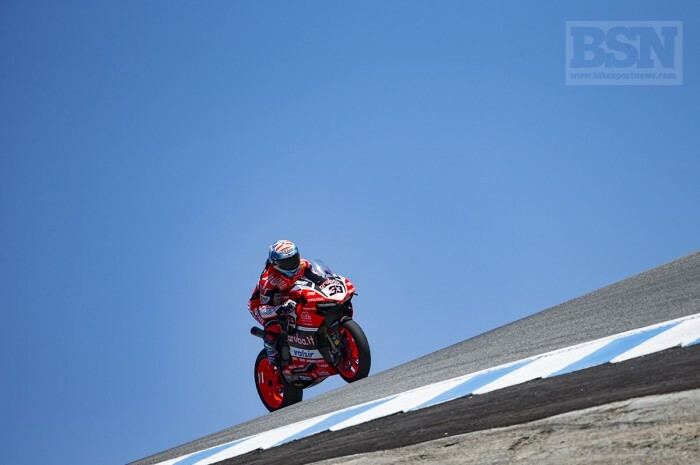 Aruba Ducati’s Marco Marco Melandri was the only man to get anywhere near reigning WorldSBK Champion Jonathan Rea in the opening practice at Laguna Seca, losing out on top spot to the Kawasaki man by less than a tenth of a second. Rea, as usual, was fastest out of the blocks, setting the pace with a 1’23.724 early doors and fending off a charge from the Milwaukee Aprilia of Eugene Laverty before gradually upping his game to end on a 1’23.393. Melandri set a 1’23.489 on his 19th lap to finish 0.096s in arrears. Laverty set his quickest time on his second flying lap, putting in a 1’23.844 but, as is becoming customary, couldn’t find any more pace. He held on to third spot and is 0.451s behind his countryman with Tom Sykes on the second works Kawasaki fractions further back. Alex Lowes looked like he was going to challenge Rea as the clock ticked down, setting a fast pace but lost out in the third sector on his quickest lap and had to settle for fourth but is the leading Pata Yamaha on a 1’23.979. Chaz Davies put his Panigale in sixth place, less than a tenth behind Lowes, while Michael van der Mark put in a 1’25.106 for seventh place. Leon Camier began his session slowly but gradually built up to a 1’24.379 to end less than a second off the pace. The Red Bull Honda man was followed by MV Agusta’s Jordi Torres with MotoAmerica wildcard Josh Herrin in tenth place on his Yamaha. Xavi Fores finished in 11th, one ahead of Camier’s team-mate and hometown hero Jake Gagne. Lorenzo Savadori finished in 14th on his Milwaukee RSV4, one behind Roman Ramos with Loris Baz surprisingly down the order in 15th. Topratz, who is making his Laguna debut, was in 17th with PJ Jacobsen in 19th. Moto3 exile Karel Hanika was last but only two-tenths behind Jacobsen on his first competitive Superbike ride.